The policy framework presented above provides a practical guide for thinking about how to achieve greater synergy between economic growth and social inclusion through the cultivation of a fuller ecosystem of relevant structural policies and institutions. The corresponding policy metrics provide a tool to gauge the level of policy effort in the different subdomains of the Framework in specific countries. These Policy and Institutional Indicators (PIIs) illustrate the extent of institutional strength or policy space utilization in this regard relative to peers. But if the ultimate measure of national economic performance is not the “top-line” concept of GDP growth but rather the “bottom-line” one of broad-based and sustained progress in living standards, new and expanded performance metrics are also required. 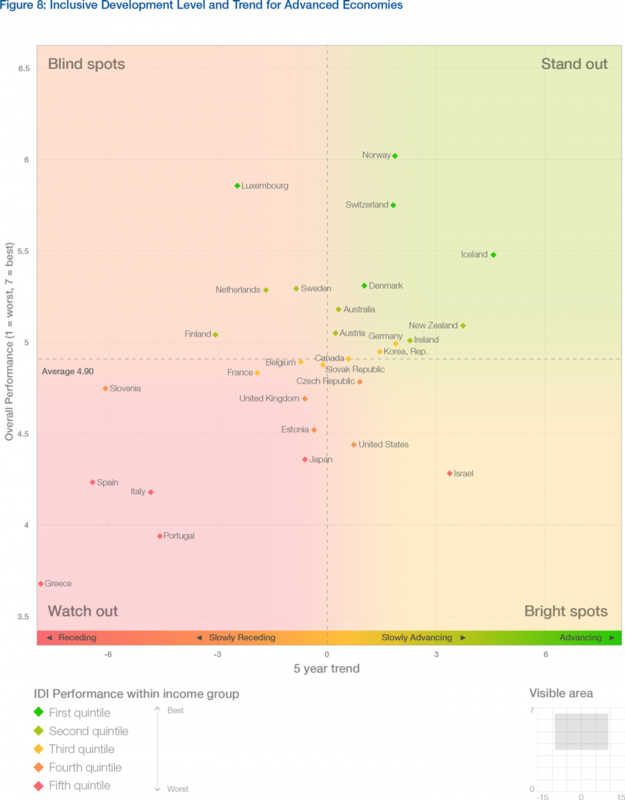 How should countries track their performance on inclusive growth and development? Given the multidimensional nature of living standards – and the systemic nature of the strategy needed to achieve and sustain them – a wider set of Key Performance Indicators (KPIs) is needed than Gross Domestic Product per capita, which is the conventional metric used to measure countries’ level of economic development. The Dashboard of National KPIs presented here includes GDP as well as the best available cross-country measures of other important facets of sustained, broad-based progress in living standards. Four such indicators have been chosen within each of the three pillars: growth and development; inclusion; and intergenerational equity and sustainability. The first pillar captures four core metrics of economic growth and development: GDP per capita; labor productivity, which underpins wages that in turn account for the overwhelming majority of household income; employment, a proxy for the breadth of economic opportunity and ultimately family security; and healthy-life expectancy, a measure of the quality of life. The second pillar includes four core measures of social inclusion: median household income, perhaps the single best proxy for the breadth of progress in living standards; poverty rate, a measure of the extent to which progress occurs at the bottom of the income scale; income Gini, the standard international measure of inequality; and wealth Gini, the analogous measure of wealth concentration. The third pillar incorporates four measures of intertemporal equity and sustainability for the reason that growth and gains in living standards are not truly socially-inclusive if they are generated in a manner that unduly and unsustainably burdens younger and future generations. These are: adjusted net saving, which measures the true rate of saving in an economy after taking into account investments in human capital, depletion of natural resources, and damage caused by pollution; public indebtedness as a share of GDP, which roughly illustrates the scale of borrowing by the current generation against the capacities of future ones; the dependency ratio or proportion of retirees and youth (under 15 years of age)to the working-age population, which is also a leading indicator of likely future pressure on a nation’s finances; and carbon intensity of economic output, an indicator of the country’s relative performance on climate change. A detailed definition of each indicator is presented in Part 3. As with the Policy and Institutional Indicators (PIIs) in the preceding section, the National KPI data has been compiled in tables comparing the pillar and sub-pillar scores of each country via a traffic-light shading scheme that ranks countries relative to their group. 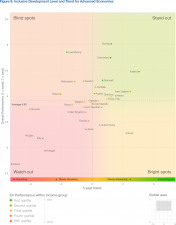 Red corresponds to the lowest relative performance within a group, yellow to the median, and dark green to the best. Since this color scheme ranks countries only within their respective comparator groups, colors are not comparable across the two groups of advanced and developing countries. In addition to the National KPI Dashboard showing each country’s performance on each individual key performance indicator, a composite index has been calculated ranking countries based on their combined scores: the Inclusive Development Index (IDI). The IDI provides composite scores and international rankings for both the absolute level of performance and the most recent five-year trend. 54 Countries are separated into two groups, advanced economies and developing economies, due to differences in the definitions of poverty between them. The result is an index that captures a more integrated picture of the relative state of economic development than that provided by GDP alone, particularly if the ultimate objective of development is understood to be sustained, broad-based advancement of living standards rather than increased production of goods and services, per se. 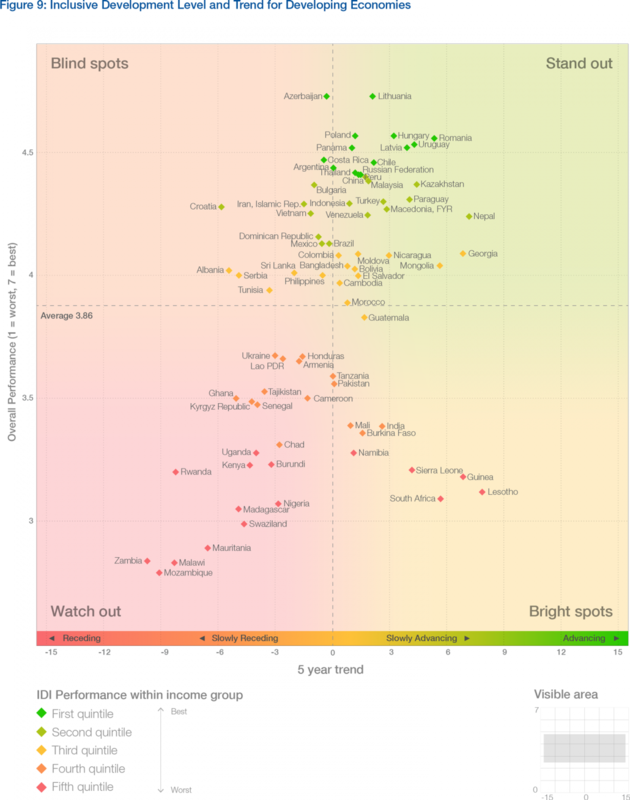 If the IDI absolute ranking of a country illustrates its level (or accumulated achievement) of inclusive development, then its trend ranking provides a window on recent performance (generally the average rate over the past five years). This is the metric most useful for governments and stakeholders seeking to assess the effect of changes in policy in the medium term, i.e., within a typical political cycle. In this sense, the trend IDI ranking and underlying KPI data are the closest analogy to the key performance indicators that business and other organizations typically use to track the effectiveness of strategy implementation. Tables 1-3 present IDI country rankings and illustrate how this new composite indicator compares with the traditional ranking of countries by GDP per capita. It is not surprising that there is a high correlation – of 0.75 – between the two measures, particularly given that the IDI includes GDP per capita as one of its 12 indicators. Indeed, Germany and Sweden have exactly the same rank for both (12 and 6, respectively) and five countries only differ by one rank, namely Australia, Austria, Denmark, Norway, and Switzerland. These are the countries whose broader inclusive growth performance is highly consistent with their growth in national output more specifically. However, three advanced countries have a rank that is at least 10 positions higher in the IDI than in the basic GDP per capita measure, namely the Czech Republic, New Zealand, and the Slovak Republic. These are countries where, despite comparatively low output per capita, much is in place for an inclusive and sustainable growth process as they move forward. The United States presents a striking counterexample. It ranks ninth in terms of GDP per capita but a very low 23rd on the IDI, the largest difference by far of all advanced economies, indicating that what looks like healthy growth is in fact characterized by significant shortcomings in terms of the inclusiveness and sustainability of the growth process. Table 3 (in Part 2) shows the difference for a selection of developing countries. Here the correlation between GDP per capita and the IDI is a bit lower at 0.73, although for many countries the relationship is quite strong, for example, for Lithuania and Hungary. However, 18 out of 82 developing countries display an IDI score that is nine places or more higher than their GDP per-capita ranking. Six of these – Azerbaijan, Nicaragua, Vietnam, Cambodia, Bangladesh, and Nepal – register IDI scores that are 20 or more places higher than their GDP per capita rankings, suggesting that their development model is considerably more balanced and inclusive than that of countries with a comparable national income per capita. By contrast, 16 of 82 countries register an IDI ranking that is nine places lower than their GDP per capita standing. Six of these – South Africa, Namibia, Swaziland, Nigeria, Zambia, and Mauritania – have IDI ranks that are 20 or more places lower than their GDP per capita standing. The Inclusive Development Index presented in this report has been calculated by giving equal weight to the three pillars – growth, inclusion, and intergenerational equity – as well as the 12 indicators therein. However, if the bottom-line measure of national economic performance is sustained, broad-based progress in living standards, then a case could be made that the indicator or indicators that most closely approximate this concept should be weighted more heavily. As measured by household surveys, median household income is attracting growing interest as an alternative to GDP per capita, the more commonly cited measure of a country’s material wellbeing.6-1 One drawback with GDP per capita is that it takes no account of distribution: it simply divides a nation’s income by the size of its population. If inequality in that country is very high, the resulting figure will provide a misleadingly optimistic suggestion of living standards for most individuals. 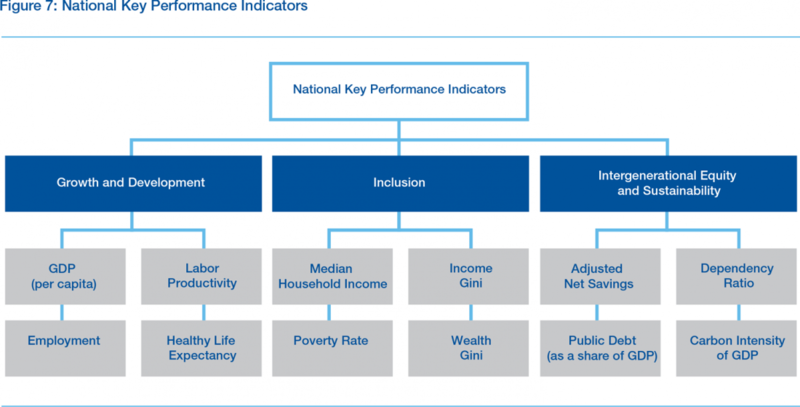 Analysis of the 12 Key Performance Indicators that comprise the Inclusive Development Index, alongside the seven pillars of Policy and Institutional Indicators, suggests that median household income is indeed a reasonable proxy for inclusive growth and development as a whole even though it captures only one of the four dimensions of broad-based progress in living standards – income; opportunity; security, and quality of life – emphasized in the Report. Of all the 12 KPIs, median household income correlates most closely with overall performance on the seven PII pillars (0.89). If the Index were recalculated increasing by a factor of three the weight given to median household income, countries ranking better would include the United Kingdom, Canada, France and Belgium. 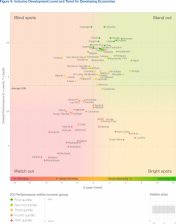 Doubling the weight given to both median household income and the poverty rate, which would capture not only income-based progress at the median but also at among the poorest of society, would see countries such as Brazil, Colombia, Mauritania, Mozambique and South Africa rise up the rankings and countries like China, Romania and Bangladesh decline somewhat. Table 8 (in Part 2) shows how the Index would look if recalculated in this manner. 54 From an econometrics perspective, the Framework and the Outcome Indicators can loosely be seen as two sides of a regression, with the Outcome Indicators serving as the dependent variable, and the Framework Indicators as the independent variable(s).